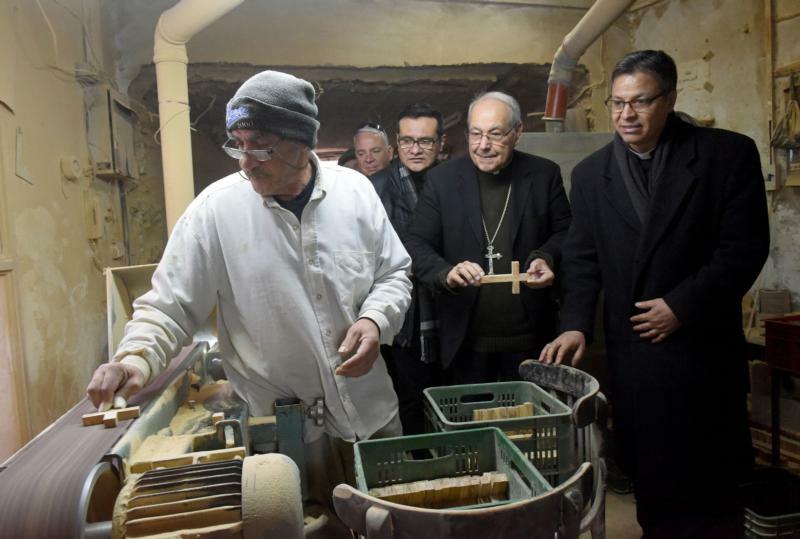 BEIT SAHOUR, West Bank (CNS) — Retired Bishop Placido Rodriguez of Lubbock, Texas, remembers the smell of woodworking and the feel of wood in his hands from when he was a child in his family furniture factory in Celaya, Mexico. Bishop Rodriguez was among 10 bishops who participated in the Jan. 18-27 USCCB Hispanic Bishops’ Pilgrimage for Peace in the Holy Land. They met with local Christians as well as with other Palestinians and Israelis to get a firsthand understanding of the situation and to advocate for “bridges not walls.” Many bishops said the pilgrimage gave them a better understanding of the Palestinian Christian reality in the Holy Land and gave them the opportunity to express their solidarity with the community, which makes up less than 2 percent of the Palestinian population. On Jan. 27, Catholic Relief Services hosted the bishops in the traditionally Christian village of Beit Sahour, near Bethlehem, for a tour of the CRS Fair Trade Partner Holy Land Handicraft Cooperative Society, and a visit to one of the artisan workshops CRS recently helped renovate to improve working conditions.